On April 1, 2013 Gabriel Cordell will take his wheelchair and his story of inspiration across America! He believes that people in wheelchairs can be athletes. He believes that people with cognitive challenges can be athletes. And he believes that even women in their 50’s can be athletes… get my drift!? 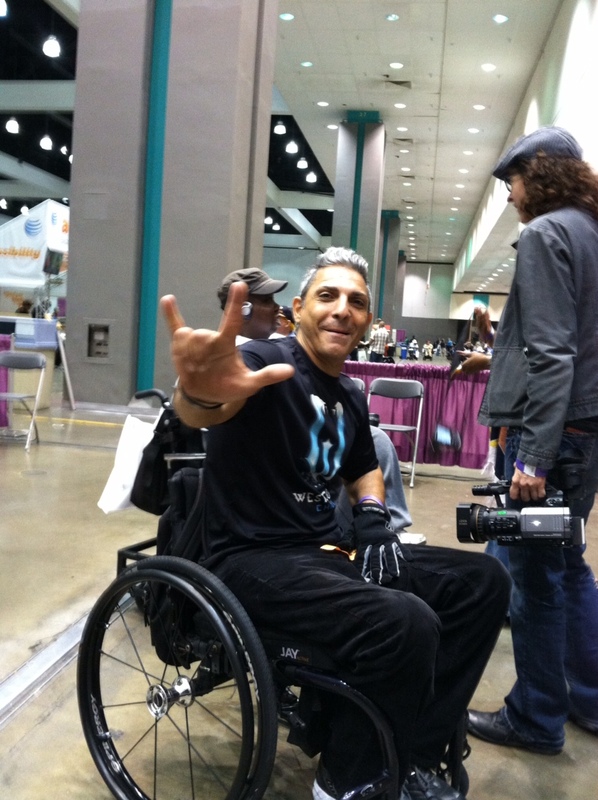 Above is a photo from this past weekend where I attended, with Gabriel and friends, the ABILITIES EXPO in Los Angeles. He had just finished scaling a rock wall with no assistance in under 40 seconds. This was faster than anyone that day.. or maybe ever. His “posse”, a film crew, lead by director Lisa France, was there to start documenting the amazing feats of Gabriel in a documentary titled “ROLL WITH ME “. This film will chronicle Gabriel’s journey from California to New York. The key component in this movie is that the stars will be a man and his wheelchair. The setting will be the roadways of the continental United States.. virtually from sea to shining sea as Gabriel starts his trek on April 1, 2013 and hopes to complete it by arriving in New York City 75 days later. Along the route he will go through the dry desert of Arizona in to the lush farm lands of the Texas, Oklahoma, Missouri until he reaches the city streets of New York City. They will all depend on the kindness of strangers to help keep them company, bring a meal or ship some supplies. The team also can use someone to donate or rent (cheap) an RV. Gabriel’s goal is simple – Inspire kids and adults with personal challenges. He hopes that people will ride alongside him in their wheelchairs, bikes, scooters or skateboards. I can’t wait to help cheer Gabriel and all on as they leave from Santa Monica! I hope you will want to be part of this magical journey, too! 3) CONSIDER DONATING food, an afternoon to meet and roll alongside Gabriel on your bike, scooter, skateboard, etc. Also, some $$ to help with expenses would be greatly appreciated. 4) Organize your group to help- such as Boy Scouts, Girl Scouts, Church Groups, CERT/EMS groups, Dairy Cooperatives, Farm Cooperatives, Local Film Societies and more!